Call (907) 562-2820 to schedule an appointment. If you want to straighten up crooked teeth or improve a bite for a more beautiful, functional smile, you’re probably considering braces. You’ve thought about traditional metal braces and see-through aligners,but have you considered braces that are placed on the backs of your teeth? Incognito Hidden Braces are the only way to make your braces truly undetectable. Clear aligners can be noticed sometimes, and they require removal every time you eat. Incognito braces hide behind your teeth at all times, so no one will know you are wearing braces unless you tell them. Incognito Hidden Braces work just like traditional metal braces do, but with a more subtle approach. Your Family First Dentistry professional will take impressions of your teeth and discuss your ideal smile with you. He can send the impressions to the lab, where they will create brackets that are perfect for each and every one of your teeth. Your dentist will place the brackets and the wires on the backs of your teeth. 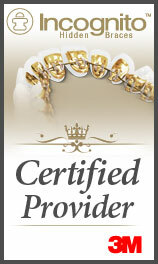 The braces will then begin moving your teeth to give you the precise, gorgeous results you are looking for. Not every dentist offers these incredible Incognito Hidden Braces. Give us a call to get started on your perfect smile today.